당선후 현직 대통령 오바마와 백악관 대통령 집무실에서의 첫 만남은 공개된 사진이 퍽 이채롭다. 적으로 트럼프의 바디 표정은 잔 뜩 쫄아 있는 것이 역역 하다는 것이다. 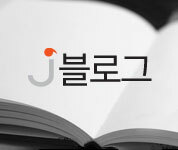 가랑이의 벌어진 폭도 중요하다는 전문의 해설이다. 80여일 후에는 그들의 위치는 정 반대로 바뀔것이 확실한대도 말이다. 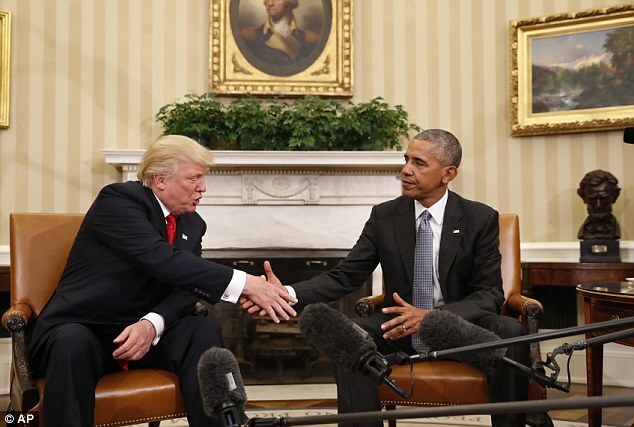 President Barack Obama and Donald Trump put on a united front and vowed to work together in what appeared to be a friendly meeting at the White House Thursday. 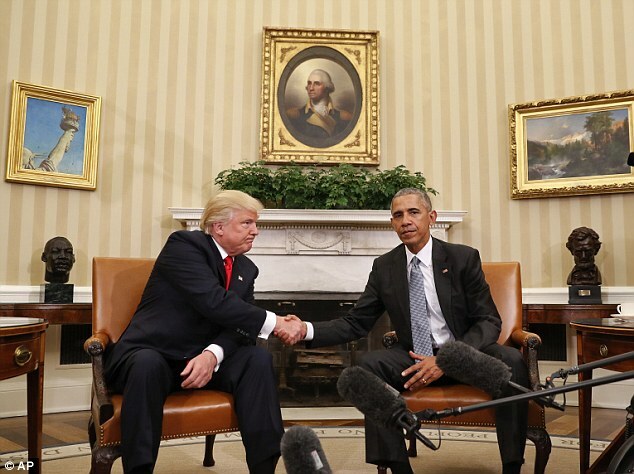 Trump said he was 'looking forward to dealing with the president in the future', while Obama claimed he was 'very encouraged by the interest in President-elect Trump to work with my team'. But even to the untrained eye it was clear there was some tension, and body language expert Patti Wood has analyzed the first meeting between the most powerful man in America and the person chosen to replace him. 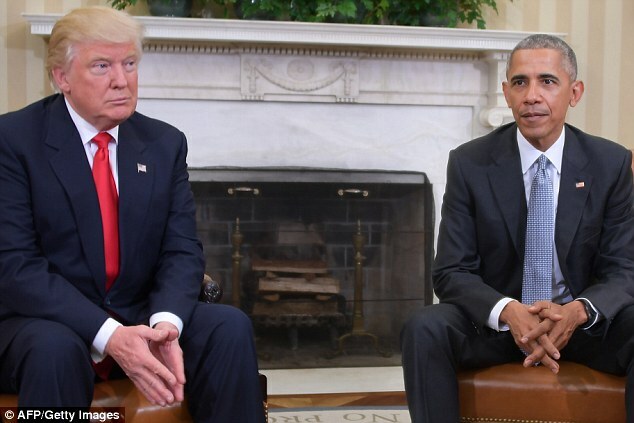 Obama was 'extremely fatigued, resigned and not hopeful', while Trump was 'tentative, serious and perhaps fearful', Wood told DailyMail.com. 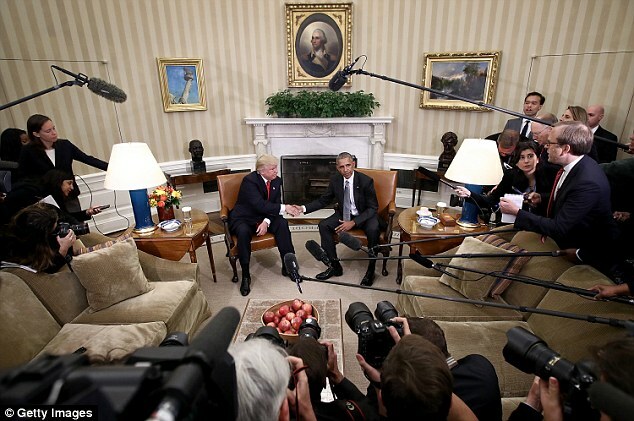 Obama and Trump, whose election win sent shockwaves around the world on Wednesday, talked for more than 90 minutes in the Oval Office before addressing the media. It was a public display intended to help the country digest the results of Tuesday's presidential election after violent protests broke out across the country Wednesday night. The president-elect called Obama a 'very good man'. 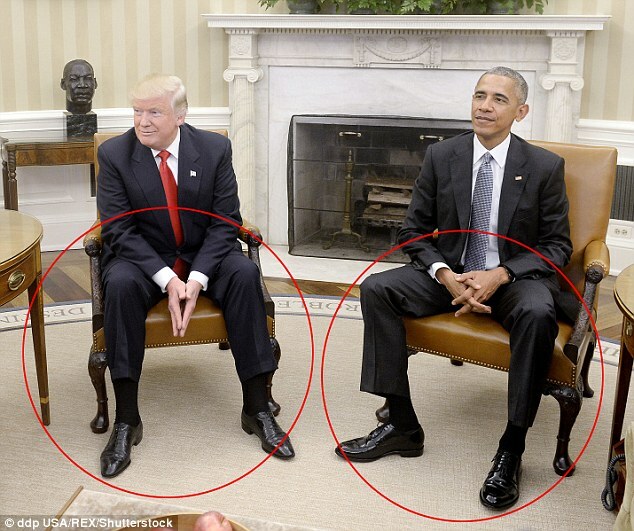 However, she adds that Obama's legs are much further apart, which demonstrates strength and reveals he is subconsciously saying, 'I'm still on top'. 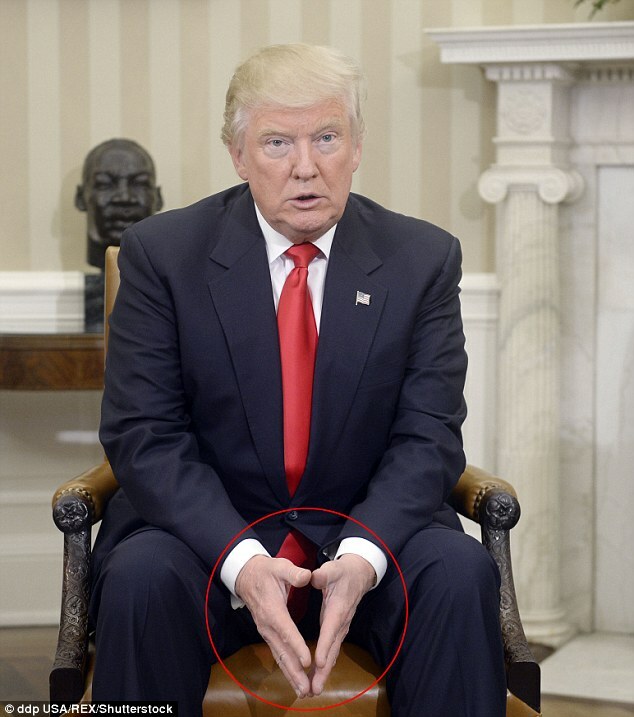 But it was Trump's hands that caught Wood's attention - he put them in a 'downward prayer position'. 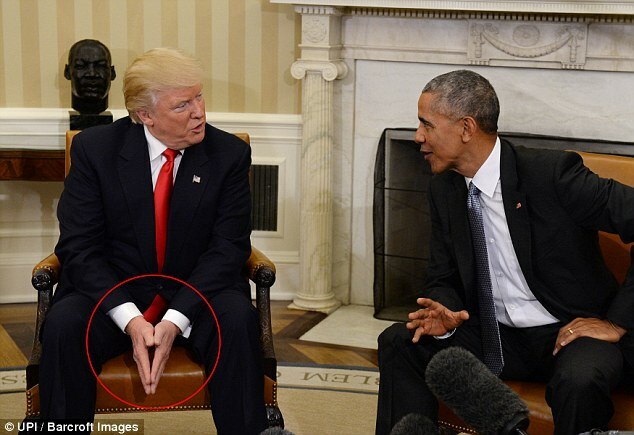 'The thing that is very significant is Trump's hand position,' Wood told DailyMail.com, describing it as the 'downward prayer position', which is not typical for the President-elect. 'Trump holds his own hands as he begins speaking which is an indication he needs to comfort himself,' she added. 'I have been very encouraged by the interest in President-elect Trump to work with my team around many of the issues that this great country faces and I believe that it is important for all regardless of party and regardless of political preferences to now come together, work together to deal with the many challenges we face,' he said. However, she does think Obama believes they have to 'work together' to face the challenges. And Trump was serious and sincere in his statements, she said. Wood, author of Snap: Making the Most of First Impressions, Body Language, and Charisma, added: 'Obama was extremely fatigued, resigned and not hopeful but very presidential. Trump and the first lady in waiting, Melania arrived at the White House on Thursday morning through a back entrance that opens up to the White House's South Lawn. The private drive is inaccessible to media, and reporters were disallowed from covering the historic greeting between the incoming and outgoing first families. A Wall Street Journal report says the White House cancelled the photo-op. The president's spokesman forcefully pushed back on the assertion in his daily briefing. 'That's not true,' he said. The White House official angrily told reporters that they were given more access to events at the White House than they were in 2008, when the Oval Office last changed hands. Then, journalists were allowed to photograph the Obamas arrival at the White House. President George W Bush and his wife Laura gave the future first couple a warm welcome when they came to the White House on November 11, 2008 for a post-election briefing. The Bushes made a show of it, posing for portraits with the president-elect and his wife in front of the White House's private entrance. Bush lined up photographers to shoot he and Obama walking down the colonnade that leads to the Oval Office. That did not happen today. No official photos have been released of the Trumps' arrival or departure.